I love Paul Rudd. Every movie he is in I watch. 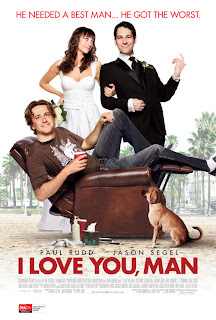 So it was impossible to resist watching I Love You, Man (2009). Paul Rudd is a very funny man, but he's the kind of looking guy who you'd likely see in a drama. Not that I suggest that his next film should be a serious comedy. People seem to get a kick out of 'bromance' genre, and with a title like 'I Love You, Man' I instantly knew this would be a complete bromance. Like Role Models (funny movie). Peter Klaven (Rudd) is a hard-working and successful real estate agent who is about to get married to the girl of his dreams, Zooey (Rashida Jones). In early preparations for the wedding, Peter realizes he has no guy-friends, because he's always hanging out with the girls. So he embarks on a mission to find a friend who could be his best man. After many tries, he meets Sydney (Jason Segel), who at first seems cool to Peter, but Zooey disapproves of him. This proves to be a lot of trouble for the future marriage of Peter and Zooey. The script is very funny, and gives you a weird look at friendship. And I'm kind of glad that I have good mates so I don't have to go searching for some on the internet. That is a bit sad. No offense if you do that. Paul Rudd, as always, is great, and Jason Segel is the perfect wild rocker guy. John Hamburg must be made to direct good comedies like this one. Must-see for comedy lovers, especially if you liked Role Models.